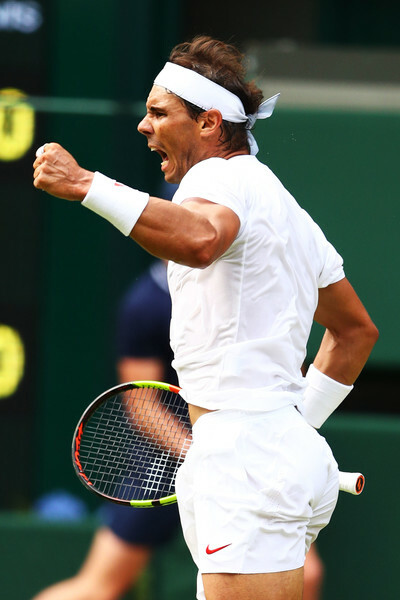 Despite some shaky moments, world number one Rafael Nadal managed to battle past big-hitting Mikhail Kukushkin to reach the third round at Wimbledon for just the third time since 2012. 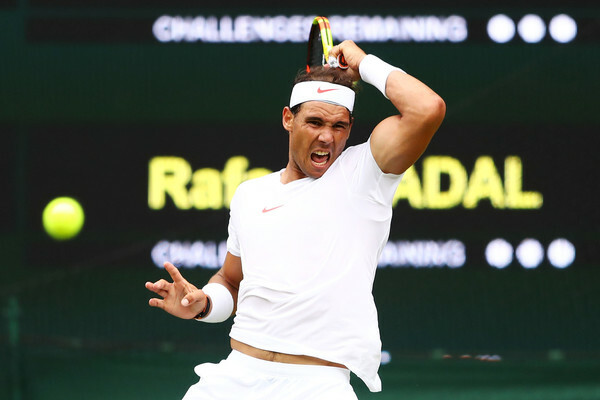 The second round of Wimbledon has been tricky for Rafael Nadal recently, with the Spaniard falling at the second hurdle three times in his last six appearances at the All-England Club. 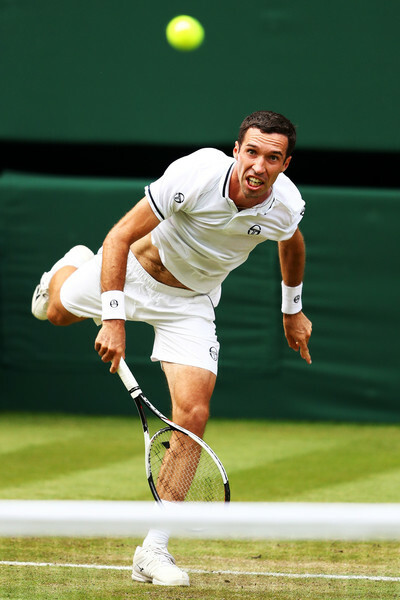 There were times in his second-round clash this year with Mikhail Kukushkin when it seemed as though the two-time Wimbledon champion was vulnerable, but he always found a way to recover, moving through in straight sets. Momentum swings were plentiful as when Kukushkin’s big shots were landing, it was difficult for Nadal to get into rallies. However, the Kazakh fell short in the big moment’s while the second seed rose to the occasion, breaking late in the first and third sets to reach the third round with a 6-4, 6-3, 6-4 victory. The opening set was all about momentum swings. There was a major turning point right in the opening game when a Kukushkin shot at 30-15 caught the net cord and trickled over for a winner. Rather than being down 40-15, the Kazakh was at 30-all and soon found himself at break point after Nadal netted a forehand. However, the world number one saved the break point by drawing an error with a deep forehand. 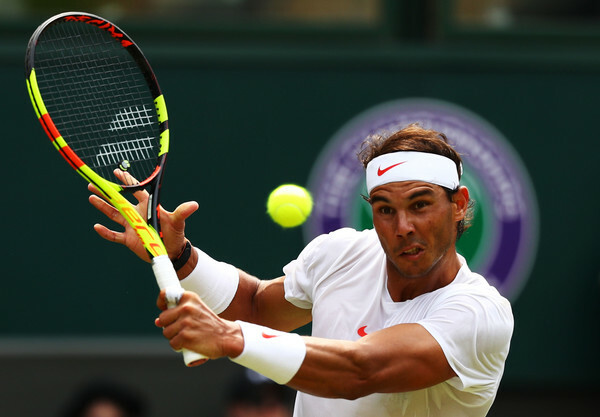 Twice more in the game, Kukushkin set up break points with winners, but Nadal saved both. On the second, the Spaniard kept a rally alive with some great defense, eventually drawing an error after a 19-shot rally. Nadal would hold the opening game after more than ten minutes. The second seed responded by grinding away at his opponent’s serve and took a 15-40 lead. He would convert the first break point by drawing an error with a crafty drop shot. Nadal would hold to love to take a 3-0 lead. The world number one had a chance to take a stranglehold on the set when he took a love-30 lead on Kukushkin’s serve in the next game, but the Kazakh rallied to hold. Suddenly with momentum, the underdog used his big groundstrokes to take a 15-40 lead in the next game and this time struck a huge backhand return crosscourt to reclaim the break. After a hold, Kukushkin had dug out of that 0-3, 0-30 hole and had leveled at 3-all. The Kazakh had a chance to increase his run to four straight games and take a break lead when Nadal sent a forehand long at 3-3, 30-all, but he missed his return and the Spaniard held. After the pair exchanged holds, Kukushkin found himself serving to stay in the set. At 30-all, he double-faulted to give the second seed a set point, but Nadal sliced a backhand into the net. A backhand long from the Kazakh gave Nadal a second opportunity and this time Kukushkin’s nerves proved costly as he sent a routine forehand into the net to surrender the break and the opening set. 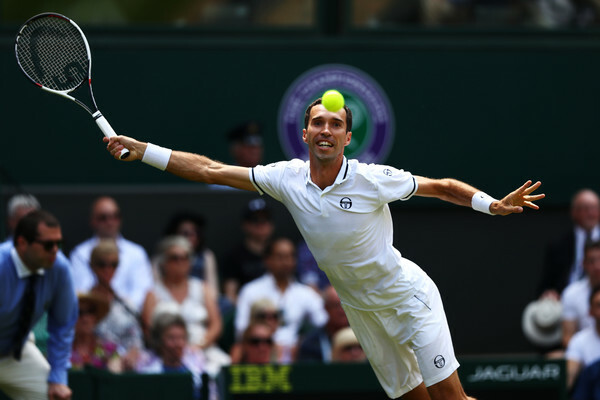 When these two met in the third round of Wimbledon in 2014, Kukushkin put up a big fight in the opening set, actually winning it before fading in the second as Nadal routed him. It looked as though history was going to repeat itself as the Spaniard took a 15-40 lead on his opponent’s serve in the fourth game of the second set. Kukushkin’s serve initially bailed him out, saving the first break point with an ace before Nadal missed a return on the second, but his groundstrokes let him down as back-to-back shots into the net from deuce handed Nadal the early break. Like the opening set, the second seed had a chance to take a double-break lead in his next return game, twice holding break points, the first set up by a crafty drop shot winner struck from behind the baseline. Neither time did Nadal manage to get his return in play and Kukushkin held to keep it at a one-break deficit. For a moment, it seemed that the momentum had swung back to Kukushkin like it had in the opening set when Nadal failed to take advantage of a chance on return. As the Spaniard served for the set, he fell behind 15-30 and was stuck on defense in a long rally, only for the Kazakh to shank a forehand. Instead of 15-40, it was 30-all. That miss would prove to be a fatal error as Nadal won the next two points to wrap up the second set. Kukushkin continued to refuse to go away at the start of the third set, taking a love-40 lead in Nadal’s first return game. But the Spaniard stubbornly refused to give in, saving all three break points plus two more at 40-AD, one of which he saved after a 21-shot rally, to hold to stay on serve. Nadal nearly made his opponent pay in the following game when he took a 15-40 lead, but Kukushkin’s big hitting bailed him out. At 2-1 on the Spaniard’s serve, he once again fell behind early, this time 15-40. He saved the first break point with an ace but missed a forehand on the second to trail by a break for the first time in the match. Nadal responded immediately, taking advantage of an easy forehand miss by Kukushkin that gave him a break point. A shot from Spaniard took an odd bounce off the grass and the Kazakh sent his forehand flying to put the set back on serve. At 4-all, Nadal would strike again. Kukushkin sent a backhand wide to dig himself into a 15-40 hole and while he saved the first break point with a huge backhand, Nadal ripped an unreturnable forehand up the line to break and move within a game of victory. The Kazakh mounted one last stand, taking a 15-30 lead, only for the world number one to win three straight points to seal the victory. Despite Kukushkin’s big power, Nadal was strong on return, limiting his opponent to only 58 percent of first serve points won and 52 percent of second serve points won. Both men had 13 break points in the match, but Nadal was far better at defending his, saving 11 of them while converting five of his opportunities. When Kukushkin’s big groundstrokes were giving him trouble, the Spaniard did a good job of taking them away by winning 11 of 15 points at the net. Nadal will meet Australian teen Alex de Minaur in the third round. It is the first time since 2011 that Nadal has reached the third round in consecutive years. Should Nadal win that match, he will maintain his number one ranking after Wimbledon regardless of all other results.